This simple, but effective twisted cane crop was made in Eastern Germany, the former GDR. A single piece of cane was split into four, leaving a solid part for the handle. The four ends were tapered, rounded and twisted together after applying hot steam. 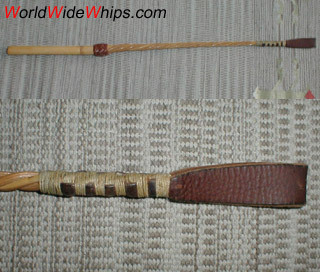 As leather was expensive these days, the only leather parts are loop and turk´s head. There are two pairs of "pinholes" at the handle´s end. Maybe there was a wrist loop which has been lost or removed.